In the wake of our recent Nexus One review, it became obvious that comparisons to other models, including one unmentionable godphone, are raising some ire. The common view: review the phone for its actual features, not what it lacks! And yet, using the Nexus One does inspire these comparisons – like driving an automobile that is almost astounding and therefore reminds you of what the vehicle lacks. Could Google somehow create a better phone in the Nexus 2? Yes, and here's how. We complained about how the Nexus One would not recognise a tilt as quickly as other phones that have an accelerometer. We won't mention the godphone, but even the BlackBerry Storm 2 and the Palm Pre respond faster. Now, we'll need to explain how the tilt works. Modern smartphones use a micro-electromechanical system that recognises orientation. However, these tiny springs (only about 3 microns in size) which sense movement work directly with software routines. It's possible the Nexus One has the hardware chops and Android is to blame, since the HTC hero suffers a similar ailment (at least the model we tested). The Nextus (ahem) should recognise tilt faster – rotating the device should cause the keyboard to rotate instantly. OK, the tilt function is the most grievous problem. However, reports of the soft keyboard on the Nexus One have indicated it might have problems as well. As we mentioned in our review, we did not experience any outright failures. However, the successor needs to address key sensitivity – you do need to sometimes press once or twice to register a key press, and that is just not going to work for our email happy society unless Google re-imagines the Nexus One with a flip-open keyboard. This is one major advantage the Motorola Milestone has over the Nexus. We're big fans of the Android OS, especially its portability to other hardware platforms including a recent Acer Aspire netbook that uses Android. There's no question that Android has a loyal following, plenty of apps, and a bright future. However, there are some headscratchers with this OS, namely that it tends to be overly technical for simple tasks, such as deleting an email. Google, put common functions on the screen where they are obvious, such as Google Maps nav options, email functions for forwarding and deleting (for messages in a list so you do not need to open each one to find these buttons), and a few key camera settings. Interestingly, the Nexus One could learn some lessons from Nokia, who tends to favour more obvious on-screen functions in the Symbian rather than sub-menus. Complaining about screen grime seems like a bit, we know. After all, most smartphones do not use a protective coating like the unmentionable device, and you can always use a screen protector. 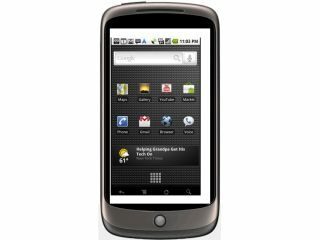 The problem is that the Nexus One screen seems to attract grease and grime, and if the successor used a protective coating, we would not need to use a screen protector. It's a minor complaint, but one that still fits our vehicle comparison where you just can't help but notice the grime. One perplexing problem with the Nexus One is that you can only download apps to a storage allocation of about 190MB. That fills up quickly with games and business utilities, not to mention media apps. We asked Google about this one and it would not go on record to explain why this is the allotment or how it will fix the problem, but the Nexus One supports flash cards up to 32GB, so we think the successor will address this problem and free up more space for downloads.